Madsen talks about the choreographer, John Cranko, and the relationship between choreographers and dancers in general. This interview was not included in Newman's books. Born in Denmark in 1942, Madsen first took the stage at age 10 as a member of the Children's Ballet of Aarhus. In 1958 Madsen joined the Tivoli Pantomime Theater in Copenhagen where he also danced as a soloist with the Scandinavian Ballet. After auditioning for the Royal Danish Ballet and being passed over, Madsen joined the Ballet of Württembergische Staatstheater in Stuttgart in 1961, under the newly appointed choreographer John Cranko. Madsen is best known for the personality and character-driven energy he brought to every performance. This sensibility motivated many choreographers, especially Cranko to create unique roles for Madsen. At the Württembergische Staatstheater in Stuttgart, Cranko developed roles specifically for Madsen such as: Lenski in Onegin, Prince Siegfried in Swan Lake, Don José in Carmen, Gremio in The Taming of the Shrew, the Joker in Jeu de Cartes, and the Youth in Poème de l'extase. Returning to Germany, Madsen rejoined the Stuttgart Ballet as a ballet master in 1990 and was appointed assistant artistic director in 1991. He remained in this post until the end of the 1995/96 season, when he once again left the company. Madsen continues working as a freelance ballet master and dancer. Companies for which he has taught include the Stuttgart Ballet, Norwegian National Ballet, the Chilean National Ballet, Nederlands Dans Theater, the Compania Nacional de Danza in Madrid and the Vienna State Opera Ballet. 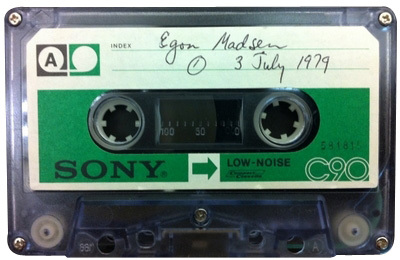 “Egon Madsen (published 1982),” Dance Dialogues: Interviews by Barbara Newman, 1979-Present, accessed April 25, 2019, http://dancedialogues.prattsils.org/items/show/28.